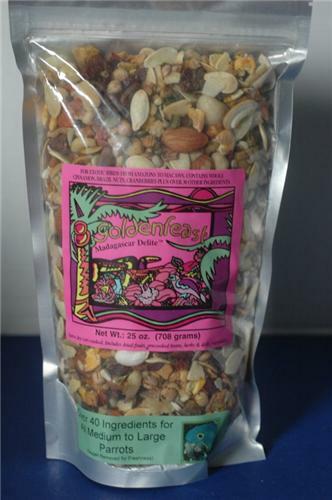 INGREDIENTS: Whole roasted soybeans, shelled almonds, in shell (white) pumpkin seed, dehydrated cranberries, dehydrated bananas, dehydrated corn, shelled roasted peanuts, safflower seed, dehydrated coconut, dehydrated papaya, Goldenfeast® Granola (consisting of: rolled oats, rolled wheat, brown sugar, canola oil, un-sulfured dehydrated coconut, sweet dairy whey, oat flour, roasted almonds and honey), dehydrated apples, dehydrated banana chips, whole sunflower kernels, and jumbo flame dehydrated white grapes, dehydrated sweet corn, dehydrated pineapple, whole filberts, whole shelled Brazil nuts, red wheat, buckwheat, whole cinnamon, dehydrated mangos, dehydrated sweet corn, dried molasses flakes, dehydrated (cooked) black beans, dehydrated carrots, dehydrated peaches, white kafir, dehydrated sweet peppers, dehydrated cherries, dehydrated (cooked) red beans, dehydrated (cooked) pinto beans, whole cashews, sterile hemp seed, pepitas (shelled pumpkin seed), dehydrated (cooked) chic peas, pine nuts, dried Lactobacillus acidophilus fermentation product, dried Lactobacillus casei fermentation product, dried Lactobacillus plantarum fermentation product, dried Lactobacillus fermentum fermentation product, dried Enterococcus faecium fermentation product, and dried Bifidobacterium longum fermentation product, and natural flavoring. GUARANTEED ANALYSIS: Crude Protein (min.) 15.25%; Crude Fat (min.) 8%; Crude fiber (max.) 7%; Moisture (max.) 5%; Ash (max.) 9%. SERVING INSTRUCTIONS: Feed dry or bring 2 cups of water to a boil. Add 1 cup of food. Simmer for 10 minutes, let cool. Refrigerate balance (or) freeze into individual serving packets. Product can also be micro-waved on high for 2 ½ minutes.